When it comes to garage door opener repairs, installations, and adjustments, it’s always a wise idea to hire our professionals at Garage Door Repair, Canyon Country. This is because our knowledgeable technicians will handle your problem in a time-efficient way, and will have the right equipment, experience and replacement parts on hand to conduct the process promptly and efficiently. 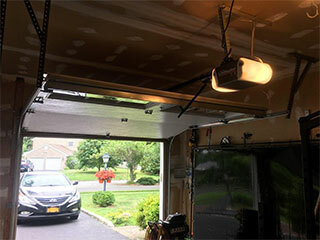 Wish to have a new garage door opener installed? You can count us to replace your old opener and all corresponding mounts and sensors by following the manufacturer's methods of assembly to get your door up and running in no time. We take special pride in being the best local service provider in the field and in providing services that are competitively-priced, efficient, and completely safe. Our expert technicians are highly trained in the field of opener replacements and repairs and our company works with top US manufacturers such as LiftMaster, Linear, and Chamberlain. Most of our newer units come with extra safety and operational features for your peace of mind and convenience. We are your best option whether you’re remodeling, building a new house, upgrading your device, or adding a new one in your garage. Oftentimes, if your garage door won’t open, is stuck halfway up, or you hear the motor struggling to raise the door, a repair service is due. Our fast and simple scheduling, as well as same-day service, make us one of the most popular picks in the Canyon Country. We want you to be completely comfortable with our service, hence we employ highly-skilled professionals only, who are courteous and will not hesitate to answer any questions you may have. Other members of our team will be more than happy to provide guidance in selecting the right opener for your system and will lead you every step of the way in our replacement and repair processes.